This suit was yet another project in the long string of projects I had been planning for a long time but always postponed due to lack of time to properly concentrate on it. Something more pressing simply always came in the way or I just lacked the mental state to get it started. 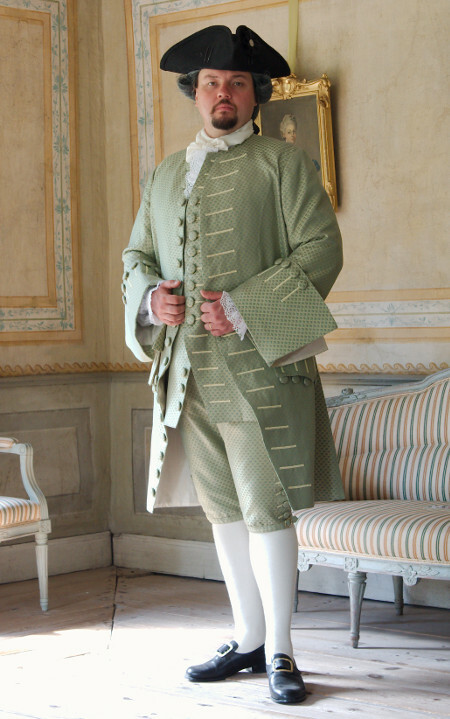 Back in 2009, after having finally finished Jarno's first 18th century suit after a lot of struggles I didn't, to be honest, want to even think of making another one. Happily memories tend to grow less painful as time passes, and I also read and learned more about 18th century men's wear and acquired a much clearer vision of the subject than the shaky ideas I had began with. The second edition of the waistcoat also gave me a lot more practical experience and confidence. At some point I decided, that Jarno absolutely needed another a bit fancier suit some time in the future. It would be a proper three piece suit all in the same material, something which would bear some distant resemblance for 18th century suit silk and fit in my hobby budget. So, this was the long planning stage. But to actually begin drafting the patterns still had to wait for finishing all more urgent thing which seemed to pop up all the time and other distractions, until at last I had some uninterrupted time to bury myself in the sewing room with rules, paper and old charity shop sheets for mock ups with also Jarno in attendance ready for interminable fittings. This was during my winter vacation in 2013, so the bolt of fabric had matured in the corner for a full year. The very first thing was to order the pictures in a larger resolution from the V&A website. I studied them long and carefully trying to get the idea of proportions of different elements, and drew the seamlines, buttons and buttonholes more visible with a black marker. I also tried to figure out from the pattern how the fabric grain settled in each piece to see how they were cut. The details in waistcoat and breeches hidden under coat were of course left open for speculation, but I got a pretty good idea of the coat. The bigger resolution also revealed something I had not noticed before: The back vent had decorative buttonholes all the way down. I considered for a moment to leave them out, perhaps also the extra buttons on waistcoat and coat fronts, but then I decided to be crazy and make them all since they were a detail of the original. Drafting the patterns was naturally based on Jarno's first suit patterns. The basic cut I had chosen for this one was quite similar, only some details had to be changed, but the fit in general needed more work. I began by dressing up Jarno in his first suit and then taking a critical eye on what needed to be improved. The waistcoat was a piece of cake: Just pinning it a few centimetres shorter and opening a bit more at the bottom. 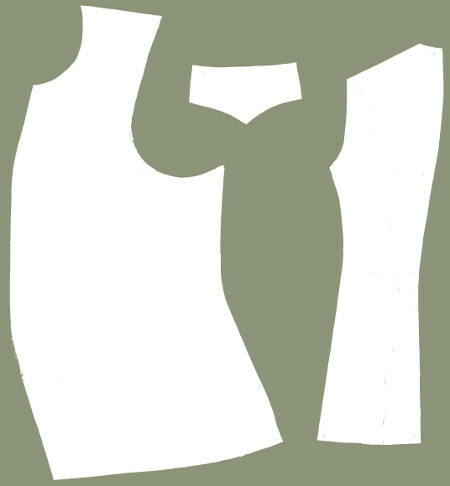 I had already drafted the armhole higher for the silk one, so that was pretty much it. I also decided that as the suit contained so many earlier elements the back lacing would not be wrong although I could only speculate its existence under the coat. 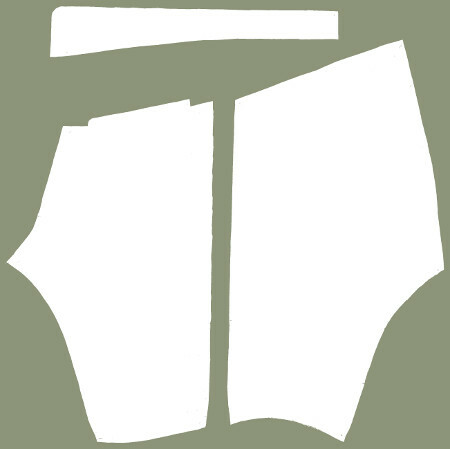 I also decided to use the old pattern for the breeches. First of all, there was of course the question whether breeches of this date would already have the new fashioned fall front. Staring very hard at the crotch of the mannequin gentleman I was almost sure I saw a button at the center front peeking out from behind the waistcoat hem. I was also lazy, so I decided to stay with the old fashioned buttoned fly I knew. I'm not even quite sure if Jarno's first breeches are quite what they should be in terms of cut, the waist may be a bit high for the earlier type of breeches designed to be worn with a long waistcoat. But they are comfy and don't hurt my eyes, and when I had already decided to keep the pattern I would not lower the waist now that they would be paired with a more open waistcoat. Another thing I could of course have done would have been to cut the waistband wider and lower the top edge correspondingly, to get a more period-correct cut, but I really must admit I was too lazy this time to disturb a pattern that roughly works on a part that hardly ever shows in wear. I was also too anxious to attack the coat to pay much attention to breeches. Maybe next time. 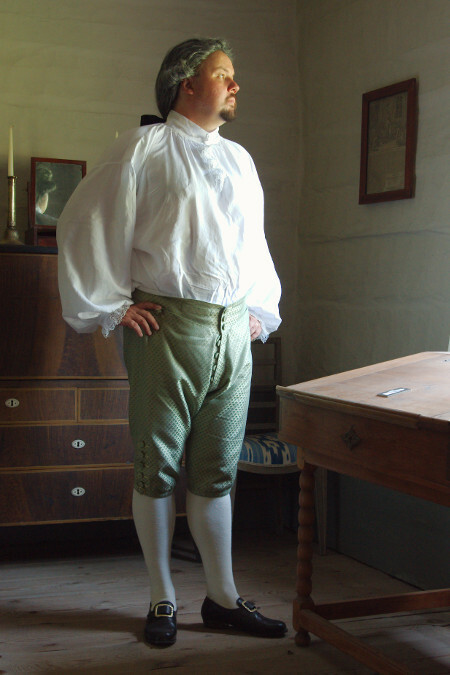 The old breeches had stretched in use hugely and at first I thought I would have to resize the pattern. I began by making a mock up with the old pattern to see how I would alter them, and to my happy surprise the mock up breeches fit perfectly. The too large waist which had caused problems was just right cut in non-stretchy material and also because Jarno had grown back to the size he had been when I originally cut the old breeches (he quickly lost weight right after that). I thought that my upholstery material would not give in as much as wool, and also decided to add a heavier interlining to the waistband. I did, however, shorten the waistband by a few centimetres, as Jarno's weight does fluctuate, and made the back slit a bit longer to give more allowance. While I kept the basic pattern the same I wanted to make the details in a more period correct way. I lenghtened the leg 2cm so I could add a proper knee band on top of it rather than as a cuff like previously. I also wanted to make a watch pocket on the waistband. 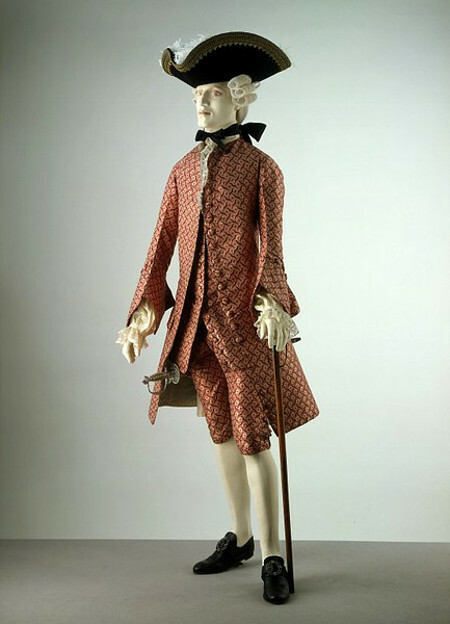 Both follow the breeches (garment no.18, dated 1750-60) in Costume Close-Up. I did, however differ from it by leaving out the side seam pockets. Why? I thought them kinda useless, and was afraid they would gap, like side seam pockets tend to do. The pattern for the coat was a lot more work, as I was not by far happy with the previous coat's fit. The skirts and the pleating in them works okay, so I decided to keep them, but the coat torso and sleeves needed serious changes. The once re-cut sleeves had been an expedient measure ruled by urging deadline, and I had never been totally happy with them. Their fit is way too modern, of which I am becoming more and more conscious all the time. The shoulders keeps sliding towards the sides all the time, so I guess they may be too small. So, I began working on both with numerous mock ups. I also suspected the skirts starting too high, so I lengthened the waist by 2cm to begin with. Having studied the pictures of the V&A suit for clues of fabric grain on the patterns I decided to try to rotate the fabric grain on the coat fronts slightly, which happily worked miracles. The front edges began to curve out more and the pleats settled in the back. Of course I had also curved the front edge too at the bottom. While the coat began to look nicer from the waist down, the top part was more tricky. It seemed too tight at the chest and shoulders. The great moment of inspiration came with cutting a horizontal line on the front at the chest line and pinning a scrap of material to fill the resulting opening. I ended up adding 1,5cm at the armhole and a bit over 8cm at the front edge. When I transferred this adjustment to the pattern I saw clearly why the period patterns curve out at the top, as my pattern suddenly had the same shape. I had, originally, drafted the coat pattern mainly bu enlarging the waistcoat pattern, and it had not occurred to me that the coat fronts, mostly left unbuttoned, needed a bit extra lenghth to fall gracefully. The period coats also had padded chests, which of course needed room in the pattern too. 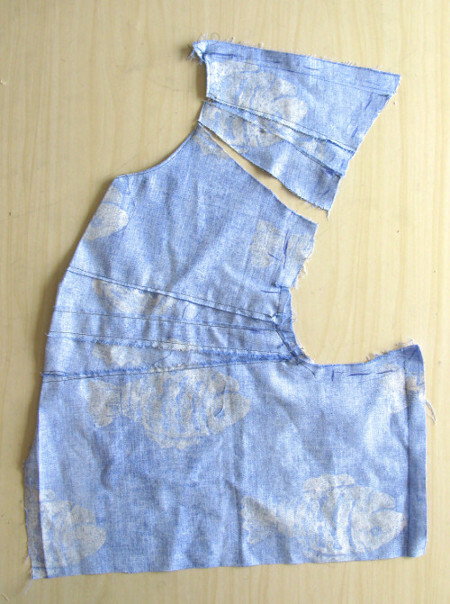 I also cut open the shoulder in a few places and pinned some more fabric on the opening. Like usual, Jarno's pattern looked somewhat differently shaped that period ones as he has a very straight shoulder line quite different from the sloping ideal of the period. Still, something in the shoulder area seemed to be amiss, and at last I ripped open the shoulder seams and let the fabric settle on the shoulder as it was wont to without regarding the seam lines. To my great surprise the front and back piece did not align at all when not forced to, a useful remainder of never closing the shoulder seam too early. When allowed to go where they wanted the front moved towards the shoulder while the back settled lower and more in. I ended up raising the back neckline for a total 4cm and also widening it at the armhole. This might of course be caused by lengthening the front at the chest, so it might be that I was in reality going back and forth. Be that as may, after some patchwork the new shoulder seam aligned again and the shoulder area seemed nicer. Like I mentioned earlier, I had originally drafted the coat pattern from the waistcoat and the waistcoat in turn based on modern waistcoat pattern. This may have caused most of my problems with the shoulder fit, but it's especially visible on the armhole. Now, having studied the period patterns more I realized that the armhole in the original coat pattern was huge both in width and height. Probably I had also been careful not to restrict the arm movements with a too small armhole and tight sleeves, but now, having also been introduced to late medieval sleeve cut in between, I have come to realize that the historical key to well fitting sleeves that also allow some arm movement without causing strain on the bodice was to make them tight but not too tight with a relatively low sleeve head. This is miles away from the fit we associate with formal suits today. So, no wonder that I never managed in incorporating an 18th century shaped sleeve into my vast armhole. I worked on the mock up, pinning extra fabric on the armhole and adjusted it's shape both with and without the sleeve mock up. Again, adding space on the shoulder may naturally have caused the armhole move lower, and at some point I suspected having been caught in the trap of altering both on turns creating new problems all along. Anyway, having finally finished, I compared the new pattern to the original to find out that the new armhole was really smaller, especially on width, which added to the width of the chest. It was rewarding to notice that this new shape was much closer to period patterns. One thing which made figuring out the shape and proportions of the pattern was the sheer size of Jarno's patterns, which made it harder to take in on a view, a thing that has always caused me problems. This time I came out with a trick of taping the large pattern pieces on the door and taking a look from the other end of the hallway, and then comparing them to the scaled copy of a period pattern. I found this very helpful. After all this tweaking, having perhaps added too much on the shoulder already, the waist began to look too long again. So, I took out the 2cm extra length I had previously added. The pocket was easy, I just copied the old pocket flap I was still happy with, and only moved it's placement a bit towards the back. I worked on the sleeves simultaneously with the coat torso. I had already when trying the old suit on Jarno pinned the sleeves narrower, as I had decided they should fit more tightly on the arm. 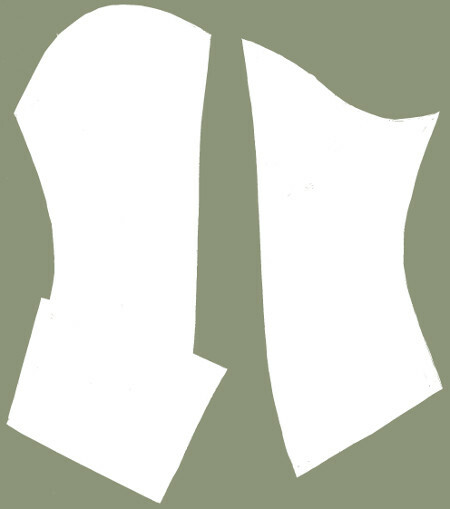 I slowly transformed the former sleeve pattern to a more period correct shape with many, many mock ups. 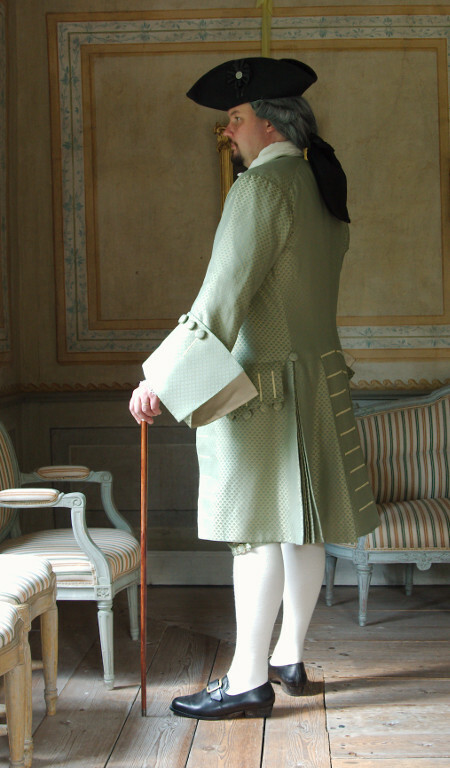 My main period pattern source was a 1730's suit in Waugh's “The Cut of Men's Clothes” (diagram XIX), which I had consulted a lot for the coat pattern and especially the skirts. 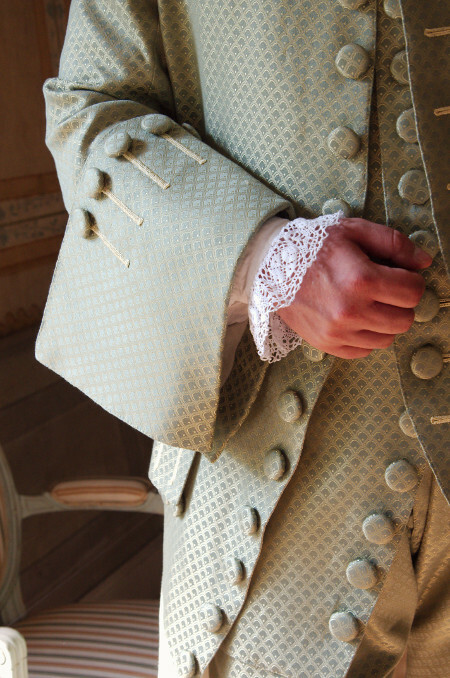 The 1730's pattern is of course much earlier than the date given at V&A, but the sleeve looks very much the same. I curved the front seam more and widened the sleeve end. I raised the underarm a bit to make the sleeve head lower. I also had to shape the front curve of the sleeve head lower. Instead, I added more space at the back curve. 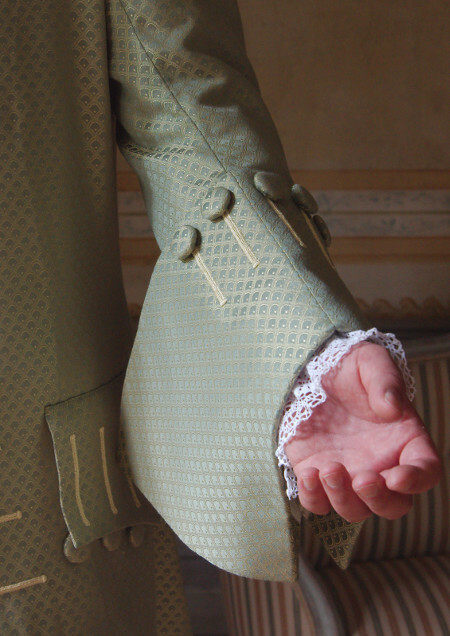 It causes some wrinkling at the back underarm, but I have come to understand this is necessary for the arm movement and a feature of 18th century suits rather than something to be avoided. After a lot of fitting and pinning and adding fabric I finally had a pattern I was relatively happy with. It looks totally different from what I started with. When I finally realized I had to make the front seam longer at the top and add more space there the sleeve head somehow mysteriously began to take a shape more similar with period patterns. It was lower than the original, but much wider, which gave the necessary space for the arm. Having acquired the sleeve head shape I fixed the armhole to fit it. 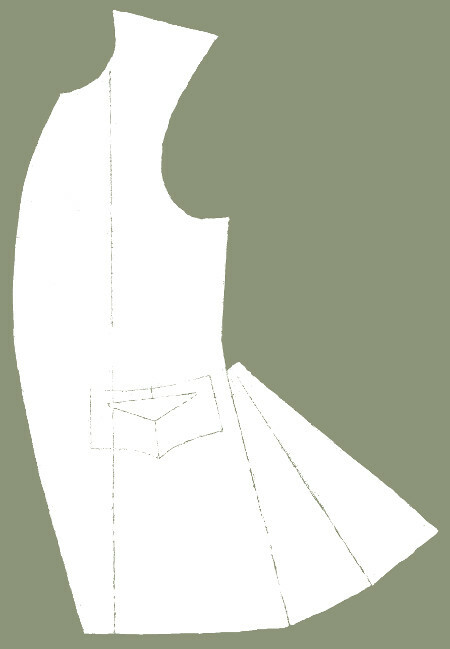 The sleeve cuff is also modeled after Waugh, and I also cut it out on old sheet to see how it would look. It may be slightly smaller than in the V&A suit, but looks balanced. With this type of large cuff the sleeve also had to shortened a bit to show off the lace cuffs and also not to look too heavy. The grand pattern reform had to be interrupted several times due to other pressing matters, and of course also performance anxiety and sheer laziness played some part. My goal was to work on the patterns and test them with mock ups until they would be absolutely perfect and final so that I could put the suit together without too many fittings or having to adjust anything. It would be damn inconvenient to have to change my seam lines or allowances after sewing on all those interlinings for example. At last, some time during the spring I finally got the patterns finished to my satisfaction. I copied patterns for the interlining pieces and began by cutting them. For the interlining I again used heavy jute. 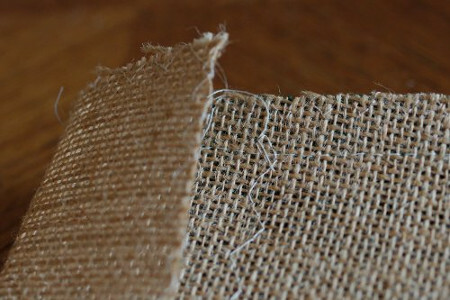 I guess I should some time try and find real buckram, but for the moment I like my inexpensive jute. Its heavy but loosely woven so it breathes. After cutting the interlining pieces I finished the edges. I had first thought to use simple zigzag but to my surprise 3-step zigzag was most effective in keeping the edges from fraying. I postponed the intimidating task of cutting the fashion fabric to the beginning of my summer holiday. On the first week, after spending the weekend with a book in shady balcony I was on just the right mood to attack the bolt of fabric. As usual, I had bought a generous amount “just in case”, and when I cut all the pieces at once I managed to fit them quite nicely even though the pattern had to be kept on the same direction everywhere. I basted most of the balance marks and sewed on the first pieces of interlining in the pocket flaps and the back slit pieces, which I packed to take with me to my summer holiday (Sweden again). I had planned to begin with the numerous buttonholes in these small pieces and then begin slowly working with the rest of the suit. On the silk waistcoat I had used cotton embroidery floss on the buttonholes. It had been nice to work with, so I had wanted to use it for this suit too. But alas, believe it or not, from the giant range of colors I couldn't find a shade that would match either of the colors of the suit fabric! Frustrated, I ended up trying the shiny viscose crochet thread I had used in Jarno's first waistcoat. It looked surprisingly good. It was thick enough to get buttonholes done quickly (a thing not to be underestimated) and seemed to have proved durable in use too. 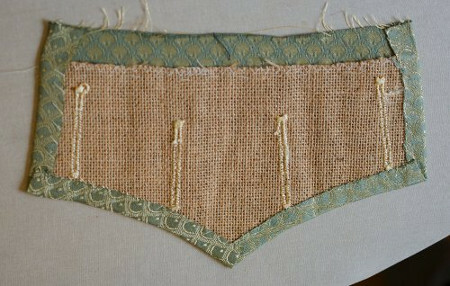 I had worked it over a heavier cotton thread base before to raise the buttonholes, but later, after having studied period examples more carefully I had realized that simple thread buttonholes tended to be slimmer. I made a test version on a scrap of fabric with only once length of the same viscose thread for base, and it looked much more delicate and elegant. I was not unhappy at all to get to skip covering the heavy thread ends. I was still not, however, happy with the thread color. It matched the fabric so and so in warm indoors light (candlelight would be ideal) but on daylight it was too rose gold for the light yellowish gold in the fabric. There was another shade in the shop, which look canary bird yellow to me at first, but went surprisingly well with the fabric. It's quite light and almost jumps out, and I'm still not quite sure if it accentuates the buttonholes rather too much in a garish way, but I decided to go with it nevertheless. 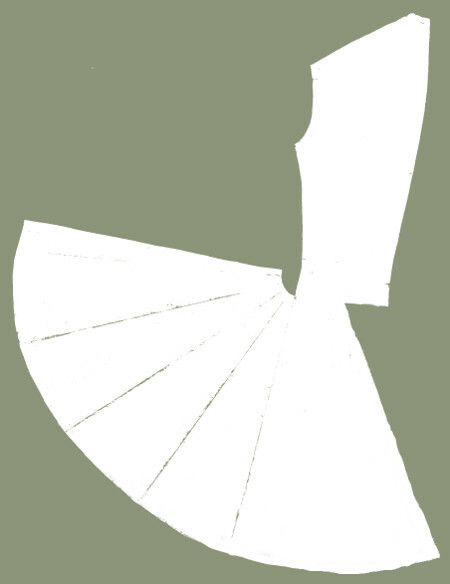 My first sewing task on the holiday trip was, however, to hem a new sheer linen petticoat I had been inspired to make for a ball at Kristinehov. I finished the hem just before we arrived at Gripsholm palace, and I counted on beginning the pocket flaps on the way back to our lodgings. After enjoying the tour we met with a nasty surprise: I had of course taken my handbag with me but very stupidly left the bag where the petticoat was on the car as there was nothing valuable there. My cousin Fabian had thought the same about his backpack. Someone else had not been aware of this but had rather tried his luck by smashing the car window and running off with both. I can't tell who was likely to be more disappointed, the filthy thieves when opening the bags or us, Fabian mourning for the fabric for his new medieval hose and the pattern for them he had spent whole previous evening drafting (due to my own experiences with joined hose patten drafting I sincerely commiserate) and me mourning my new petticoat and also sentimentally my little sewing kit purse I have carried with me almost everywhere for the past years. More reason to despair came with realizing that I had had the whole coil of buttonhole thread in the sewing kit, so even though I had left the back slit pieces at the lodgings I could not work on them without the damn thread. And then of course there was the small matter of getting a new car window late on the eve of a national holiday. Happily my sweet cousin Johanna (at whose home we were staying) and her husband let our use their car the next day so we made it to a piquenique at Drottningholm palace grounds and on the ball at Kristinehov on the evening. 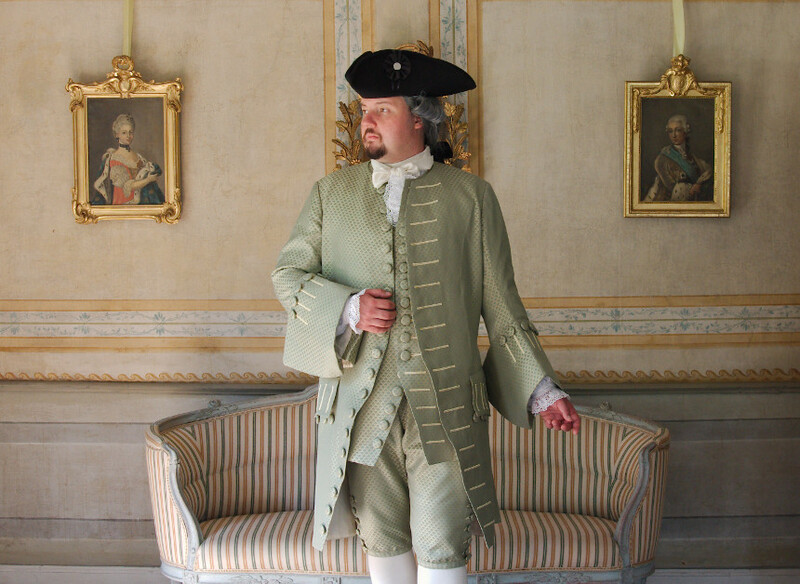 I wore just my white under-petticoat with my floral printed polonaise and it didn't scream scandal too loudly, Fabian wore his old hose to the LARP on the weekend and we even managed to get the car window replaced the following day. We were driving around during that week, sightseeing and visiting my aunt, and at first I was about to go crazy without my sewing, but gradually learned to sit still empty handed. Other ways the holiday was quite perfect. Back home I hurried on the haberdashery shop to grab some more thread, but again I was in for a nasty surprise: They had run out of my thread, and might get some more in a month.